In 2003, Halbert Mill Co. designed the first plastic cartons for the stone industry. Since that time, we have shipped countless truckloads annually to stone companies across the nation. Our surround features 2 halves that are attached to a 2x4 frame to make a stackable surround in your custom size. 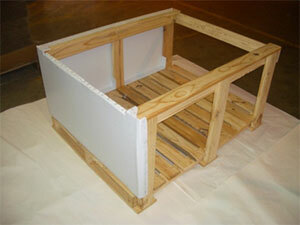 Customers furnish the pallet and frame materials and assemble on site. A loaded pallet may weigh up to 3000 lbs. Custom surrounds can be produced in a variety of colors and can be printed to match each customer’s logo or design. 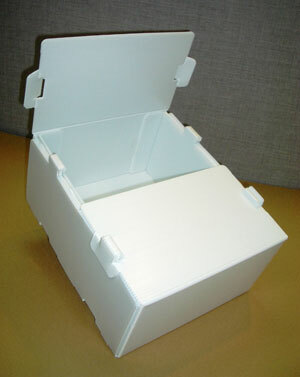 Our most popular carton requires no glue and measures 23.5x15.5x7 inches deep. They are designed to fit five per layer on a 40x48 pallet. A loaded carton will weigh between 100-150 pounds. Custom Handifold cartons can be produced in a variety of colors and can be printed to match the customer’s logo or design.